Introduction: HIV viral envelope proteins are targets for small inhibitor molecules aimed at disrupting the cellular entry process. Potential peptide-class inhibitor molecules (rDNA drugs) have been previously identified, with mixed results, through biomimicry and phage display experimental methods. Here we describe a new approach based on computational fragment discovery. The method has the potential to not only optimize peptide binding affinity but also to rapidly produce alternative inhibitors against mutated strains. Methods: A comprehensive, all-atom implicit solvent method is used to bombard the C-heptad repeat unit of HIV-1 target envelope protein GP41 with single Damino acid residues as they exist in their native state. 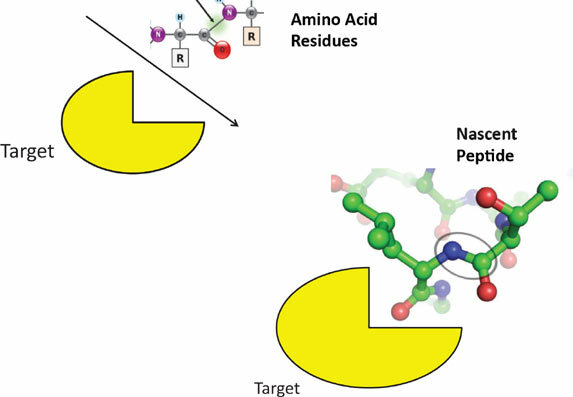 A nascent peptide computational search process then identifies potential favorable sequences of attached ligands based on four peptide bond criteria. Finally, dynamic simulations of nascent peptides attached to host targets help refine potential peptide inhibitors for experimental HIV-1 challenge assays and testing. Results and Discussion: Initial testing of the method was done using 64,000 total ligands of D-amino acid residues at a total computational time of 0.05 microseconds per ligand, which resulted in several thousand attached ligands. Peptide bond criteria search employing three of the four bond constraints with a tolerance of 20 percent, resulted in four potential peptide inhibitors of 5 to 6 residues in length. Only one of the four peptides demonstrated IC50 values and partial viral inhibition based on cell challenge assays using CEM-SS host cells. That peptide inhibitor also computationally demonstrated longtime attachment and stability to a helical groove in its C-heptad target. This initial testing of peptide fragment discovery against HIV-1 has helped us refine the protocols and identify key areas of improvement. Keywords: Envelope proteins, fragment discovery, HIV, implicit solvent methods, peptide inhibitors. Keywords:Envelope proteins, fragment discovery, HIV, implicit solvent methods, peptide inhibitors. Abstract:Introduction: HIV viral envelope proteins are targets for small inhibitor molecules aimed at disrupting the cellular entry process. Potential peptide-class inhibitor molecules (rDNA drugs) have been previously identified, with mixed results, through biomimicry and phage display experimental methods. Here we describe a new approach based on computational fragment discovery. The method has the potential to not only optimize peptide binding affinity but also to rapidly produce alternative inhibitors against mutated strains.